FULL ACCOUNT AVAILABLE.Jason Politte and I started the day in Denton, TX targeting Haskell. We arrived in the target area at 2pm to find storms had initiated earlier than expected and were producing weak anvils. However, one storm rapidly strengthened near Rotan and was placed under a tornado warning. 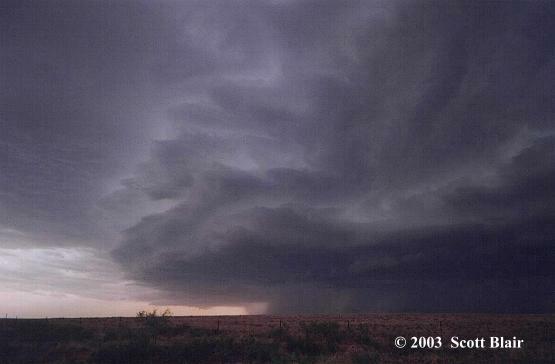 Storm produced a wall cloud and it continued to persist and tighten up into a large cone tornado that eventually morphed into a stovepipe during its seven minute lifespan. The tornado touched down at 3pm about 4 miles SSW of Aspermont. New meso and associated wall cloud moved east to just south of Old Glory, TX. Awesome motion was observed as the meso crossed the road. Very large hail soon followed. Observed a weak tornado near Meridian, OK from a mini-supercell. A strong upper level low was centered over Oklahoma and enhanced the vorticity over the region. The majority of the cells motion observed was to the NNW. Most tornadic activity ended by 4pm. The tornado lasted for about three minutes under poor contrast. No damage was observed. 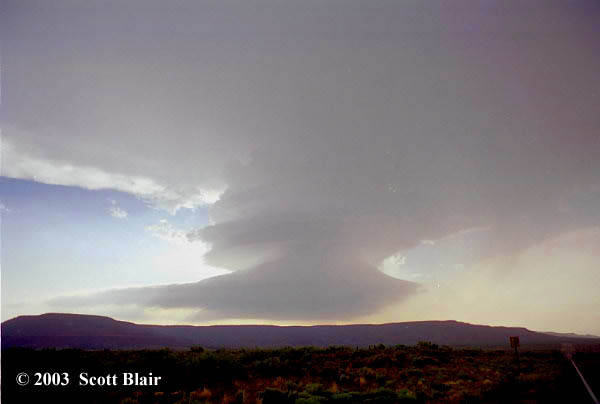 Strong upslope flow and a weak disturbance resulted in a nice supercell in Northeast New Mexico. Eric Nguyen and I intercepted the storm north of Clayton, observing an impressive surface boundary feeding into the storm. We stopped four miles north of Moses and verified hail size. 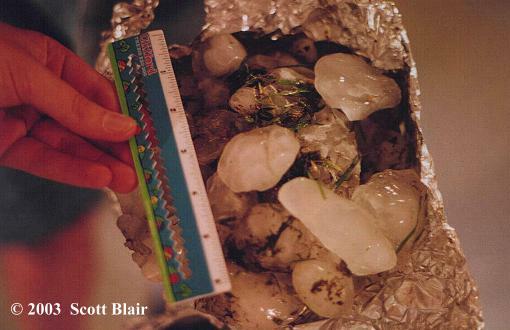 Numerous two inch stones with some larger pieces were measured. 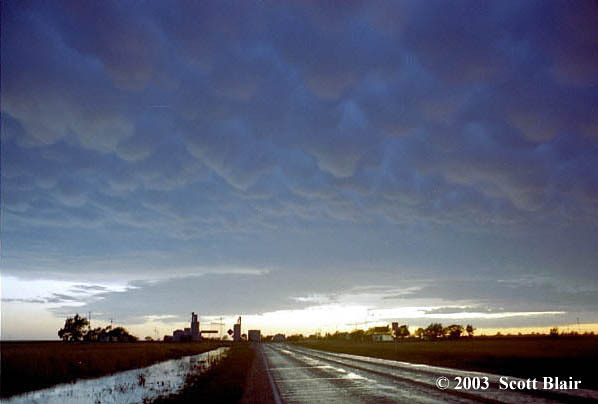 We ended the day with mammatus in AMA. Eric Nguyen, Jeff Lawson, and I observed a couple severe storms in SW Kansas. Cells fired along a lee-side trof in SW Kansas. A significant amount of dust was observed with winds around 50-60mph. Visibility, at times, lowered to zero. 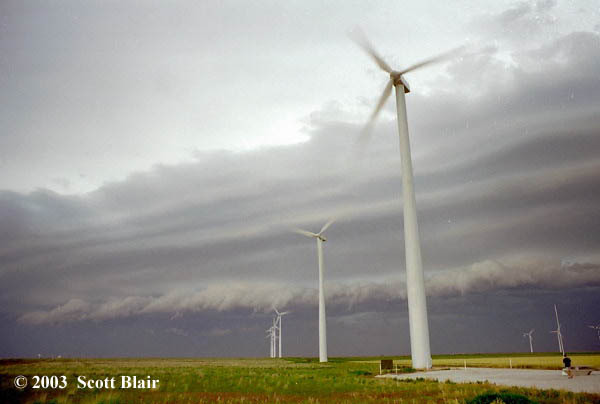 The highlight was an awesome layered shelf approaching the wind power plant farm at Montezuma. We ended the day driving to Raton, NM. 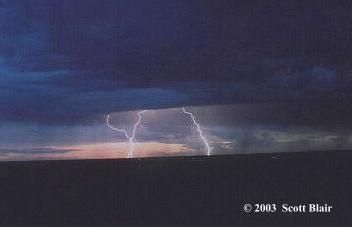 Eric Nguyen, Jeff Lawson, and I observed nice storms in Northeast New Mexico. Upslope flow and mesoscale boundaries initiated storms in SE CO. We followed these storms southeast into NE NM. We passed through the Capulin area and discovered white mountains due to hail. After taking a few stills, we continued to Clayton where numerous high based storms developed. We stayed the night in Clayton, NM. FULL ACCOUNT AVAILABLE.At Mosquero, we witnessed the best structured supercell I've seen in New Mexico. 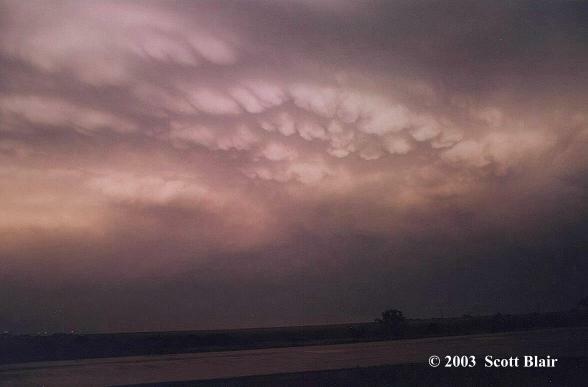 This LP was breathtaking as it developed numerous striations, spinning across the open land. The climax of the cell lasted for a good 30 minutes before the LP slowly lost structural organization. The stills don't do this LP justice as the feeling of watching this extraordinary supercell was absolutely breathtaking. Ending the day near Mosquero, NM, we had a nice view of the first LP viewed to the east with mammatus. Second LP shines golden with the setting sun. Third day in a row for upslope activity across NE NM. Eric Nguyen, Jeff Lawson, and I observed two supercells, one long-lived. At 19:29 UTC, we observed a tornado for two minutes about 15 SW of Capulin, NM. We were looking from dirt/boulder Hwy193. A supercell near Raton finally got its act together and was close to producing. However, it appeared too outflow dominate to sustain balanced low-level circulation. 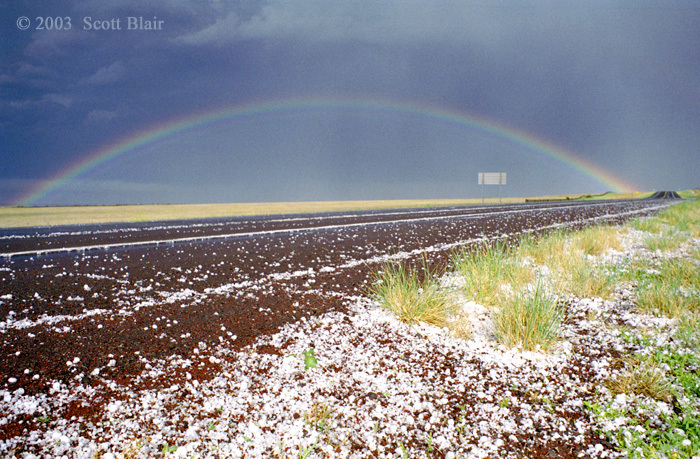 We later encountered 2.25" hail 5 NW of Sanchez, NM. Fourth and final day in a row for upslope activity across New Mexico. Eric Nguyen, Jeff Lawson, and I observed weak activity north of Newkirk. I targeted a stronger cell near Santa Rosa, NM. The cell finally showed nice structure near Fort Sumner, where it gusted out with strong winds and lofted dust. After a few stills, I ended the day in AMA. FULL ACCOUNT AVAILABLE.we observed a nice supercell near Mills, NE. The cell was complete with a backsheared anvil and nice round base. It was clear the storm was rapidly organizing and showed signs of lowering. We stopped about 10 miles north of Atkinson. Two supercells were now visible, one due west and one southwest from our location. The northern cell showed signs of a RFD and a horizontal funnel. Seeing this, I blasted west towards the storm. Soon after, a funnel rapidly lowered and the Atkinson Tornado was born. The tornado was located NW of Atkinson or due north of Stuart. From our location, the tornado was 2 miles away nicely contrasted as it slowly moved closer. After going through a few shapes during its 9 minute life, the tornado lifted and the RFD occluded the updraft. We quickly turned our attention to the supercell now NW of Emmet, NE. Not long after, a dusty tornado developed north of Emmet. 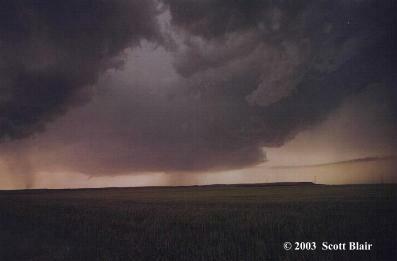 The tornado continued to rapidly strengthen as a funnel plunged into the dust plume. 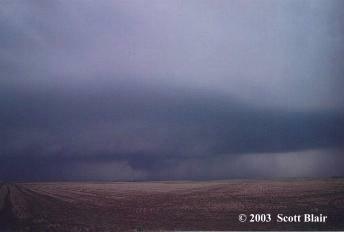 A F3 wedge tornado was now present as the RFD and associated wrapping rain/hail curled around the meso/tornado. 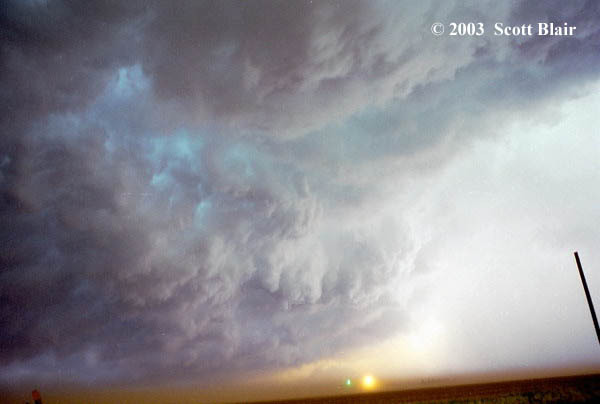 During this process, a well-defined satellite tornado developed SW of the wedge and lasted for about one minute. 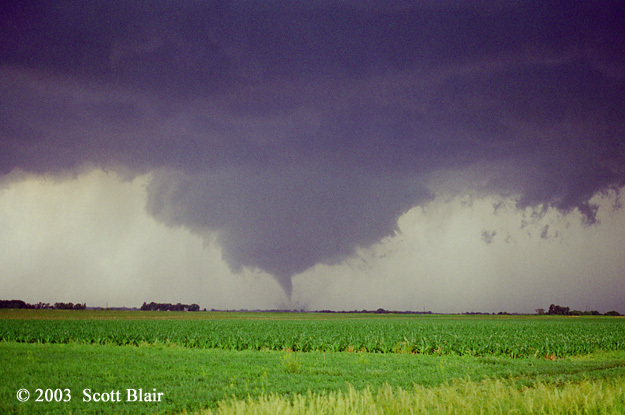 Within five minutes, the tornado and meso were fully wrapped. Eric Nguyen and I observed several well-structured supercells across Central South Dakota. Several false reports of tornadoes from public. We followed the cells down to I-90 where we were treated to an awesome lightning show with a full moon. South Dakota is awesome. Eric Nguyen and I decided to play several boundaries across Eastern Colorado. The day mainly consisted of small hail and strong microburst winds. Heading back south to end the day, a nice shelf was observed at sunset with numerous close cg lightning. Eric Nguyen and I targeted the TX Panhandle and observed a decent supercell. The cell appeared to have problems keeping a well-defined RFB. 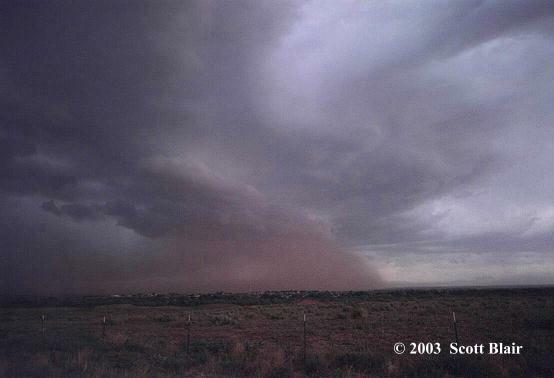 Strong dusty inflow was observed as the storm moved/developed westward. The day ended with a squall line from NM overtaking the storm. We let the squall pass and observed nice mammatus on the backside. Eric and I observed several multi-cells and one supercell storm across NE CO into SW NE. The storms overall had trouble sustaining in CO. Later in the evening, we targeted one cell west of Ogallala, NE. The storm looked much better in structure and even produced a brief funnel once the RFD wrapped around. We continued following the cell and then turned our attention to a new cell near Chappell. Heading south of Oshkosh on Hwy27, we observed a 1-2 minute long tornado over the Chappell area. The day ended shortly after as a squall line rapidly organized. After the previous chase (6/22), we stayed the night in Grand Island. We decided to survey the reported volleyball sized hailstones. 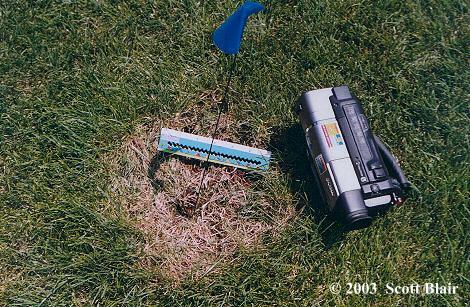 After observing many large stones (5"-7" diameter) and 13" diameter craters, we concluded some stones were 7"-10" in diameter. For more details, please e-mail me. 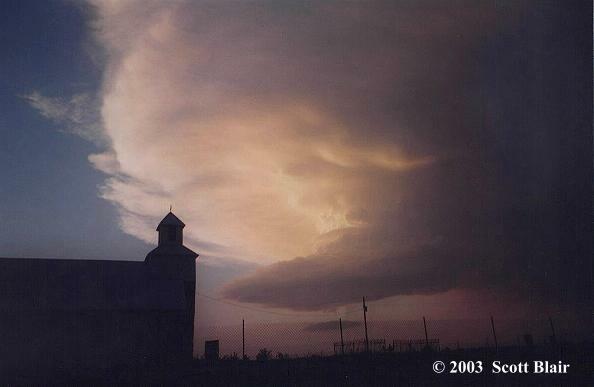 After the survey, we headed to O'Neil where a large supercell developed. We blasted east to Verdigre and dropped south on Hwy14. We soon spotted a poorly contrasted cone tornado north of Royal, NE. The tornado lasted for about 5 minutes, although it appeared the circulation was fairly weak. We decided to head north to verify hail size when another forward-flank meso produced a weak tornado less than .2 miles north of us. The tornado damaged power lines and trees and caught one transformer on fire. Darkness was setting in and we ended the day back in Grand Island. FULL ACCOUNT AVAILABLE.A violent supercell developed during the late afternoon hours of June 24th across SE South Dakota. Eric Nguyen and I captured the storm from the beginning stages. 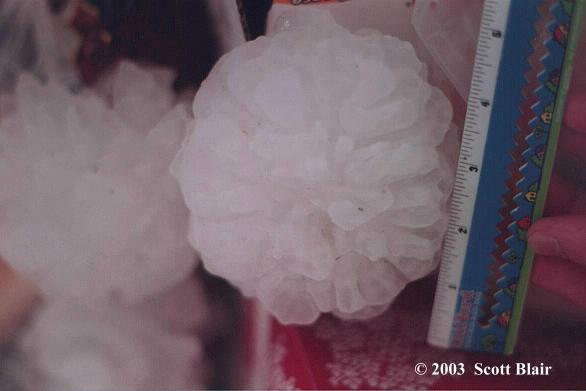 The cell went on to produce 13 individual tornadoes observed from close range. The first tornado witnessed occurred at 7:33pm and the last tornado dissipated at 9:45pm. 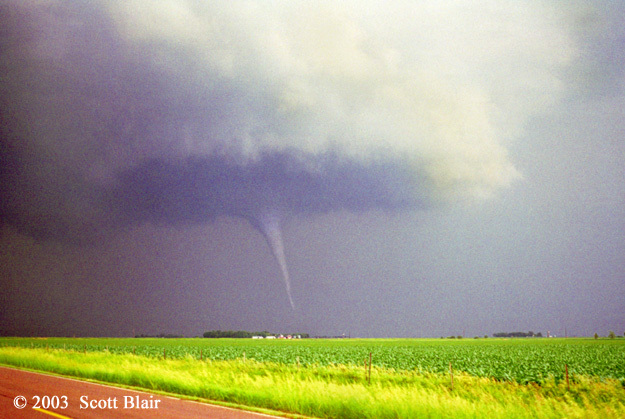 Virtually every shape imaginable was observed with the plethora of tornadoes, some on the ground at the same time. Several areas of damage were noted as well as power flashes, but luckily no injuries were reported. Other than the tornado show, the structure and motion was breathtaking. This possibility was a once in a lifetime event!